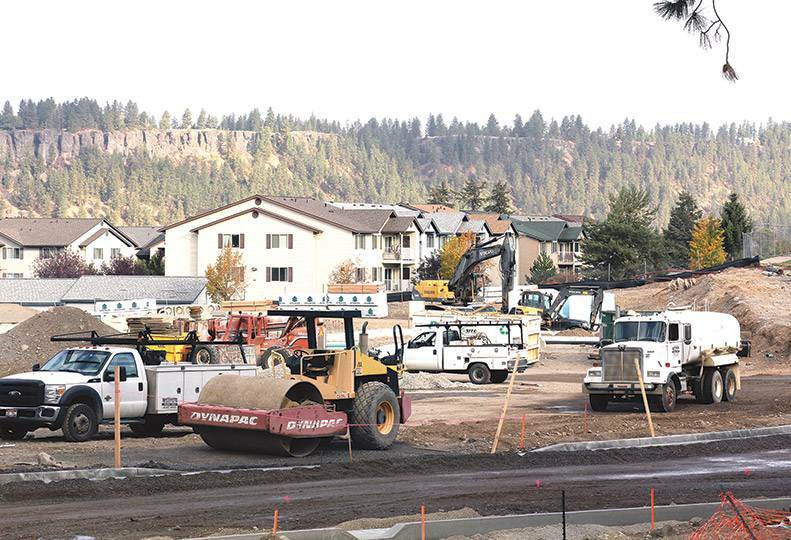 New rental units go up at the $18.1 million Winter Heights complex in Spokane Valley. Housing costs are rising in Spokane County, but the most recent Spokane Community Indicators Initiative analysis of U.S. Census Bureau data indicates percentage of renters who spend more than 30 percent of their income on housing has remained relatively level in recent years. Average apartment rents in Spokane County rose to $977 in spring 2018, a 7 percent increase from $913 in spring 2017, according to a survey compiled by the Runstad Center for Real Estate Studies at the University of Washington. However, the percentage of renters in the cost-burdened category—those who spend more than 30 percent of their household income on shelter—remained about the same in 2016 and 2017 and is somewhat lower than years during and immediately following the Great Recession, says Patrick Jones, executive director of the Institute for Public Policy and Economy at Eastern Washington University. Cost-burden data isn’t yet available for 2018. In 2017, 48.2 percent of Spokane County rental households were in the cost-burdened category, compared with 47.8 percent in 2016. Jones says the difference between those two percentages are within the margin of error, meaning the change is statistically insignificant. Community Indicators data show the percentage of renters paying 30 percent or more of their income on shelter costs rose during the height of the recession but has dropped back down recently. In 2006, before the Great Recession, the percentage of surveyed renters paying 30 percent or more was 46.1 percent. That ratio rose to 52.1 in 2012 in the aftermath of the historic economic downturn, before trending slightly downward in following years. The percentage of severely cost-burdened households—those spending 50 percent of more of their household income on shelter—also hasn’t changed much in recent years, says Jones. For 2017, Community Indicators data show 22.9 percent of households were severely cost burdened, compared with 24.9 percent in 2016. James Young, director of the Washington Center for Real Estate Research at UW, says the rising rental costs might be affected by Spokane’s low vacancy rates and new unit construction, in which rent tends to cost more than in older buildings. EWU’s Jones says he’s not sure if “there’s one particularly good answer” for why the percentage of cost-burdened households have stayed about the same if rents are rising. “If incomes are going up, and rental costs are going up, they offset each other—that’s the simple explanation,” he says. However, Spokane median incomes didn’t rise very much in 2017 on a county level, he says. “My guess is renters are typically below median income, so the question is whether their incomes went up faster than household incomes above median level,” he says. Regardless, more than one-fifth of people within Spokane County still spend at least half of their income on rent, and that can cause those renters to make tough decisions, says Jones. Households that spend at least half of their income on shelter could see those finances cut into other necessary expenses, such as health care, childcare, food, and transportation, among others, he says. What is clear, though, is that vacancy rates remain low in Spokane County, he says. In another analysis of U.S. Census Bureau data, Community Indicators found the overall rental vacancy rate in 2017 was 2.4 percent in Spokane County. That’s lower than overall vacancy rates of 3.7 percent and 6.2 percent for Washington state and the U.S., respectively. Low vacancy rates likely are driving development of apartments and other residential projects throughout Spokane County. For example, the Journal recently reported three separate apartment complex projects in the works around the county. •On the West Plains, preliminary plans submitted to Spokane County call for a large apartment complex on 9.9 acres of land on the southwest corner of Westbow and Hayford roads. As proposed, the complex would consist of 216 living units in nine apartment buildings, a recreational building, a pool and barbecue area, a clubhouse, and two ponds. •The city of Spokane is reviewing building permit applications for a $10 million apartment complex to be named City View Apartments at 1403 S. Assembly Road, in west Spokane, public records show. A&A Construction & Development Inc., of Spokane, is listed as the general contractor on the project, and Architecture All Forms, of Spokane, designed it. •Spokane architect Shane Mercier has submitted a predevelopment application for a 36-unit apartment complex to be located at 920 and 950 E. Fifth, east of downtown Spokane. Two three-story, 12-unit buildings and a seven-stall garage would be constructed at the southeast corner of Fifth Avenue and Conklin Street, and another three-story, 12-unit building and nine-stall garage would be constructed at the southwest corner of the intersection.